South African police are investigating the disappearance of a German auto executive who went missing three weeks ago while on a business trip to the country. Uwe Gemballa, founder of Gemballa Automobiletechnik, is internationally recognized for his Porsche conversions. He was apparently in South Africa to consider opening a dealership in Johannesburg. "South African police are working with German police and are investigating a missing persons inquiry," police spokesman Vishnu Naidoo said, adding there was "inconclusive" evidence to suggest kidnapping. German media reported that Gemballa, 54, had asked his wife to wire 1 million euros ($1.35 million) to a bank after he was involved in an accident. Naidoo said Gemballa arrived in South Africa on Feb. 8 and was due to leave on Feb. 10. "But there is no trace of him thereafter." Gemballa's tuning company, based near Stuttgart, is well known for record-breaking super car conversions that sell for between 250,000 and 700,000 euros. The company employs about 40 people and has branches in Australia, Europe and the United States. Its clientele includes Arab royalty, movie stars and the mega rich. The mystery surrounding Gemballa's disappearance deepened when German media reports said on Tuesday that his company sought insolvency protection. Gemballa's wife applied on Monday to a German regional court in Ludwigsburg for bankruptcy protection for her husband's business, the Deutsche Presse-Agentur (German press agency) said citing a court spokesperson. A temporary insolvency administrator is being appointed, the court said. 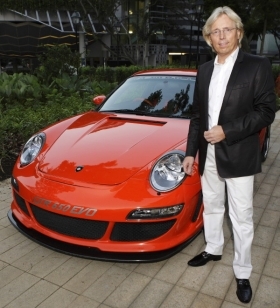 Uwe Gemballa poses with the Porsche Gemballa Avalanche GTR-650 EVO. Two German police officers are in South Africa to assist with the investigation. Gemballa's disappearance comes three months before South Africa hosts the FIFA Soccer World Cup, and the German media reports suggesting he could have been kidnapped were likely to put South Africa's high crime rate in the spotlight again. German soccer federation officials last month blamed slow World Cup ticket sales in Germany on security concerns and high travel costs.